Set amidst the Blue Ridge mountains, just below Mt. 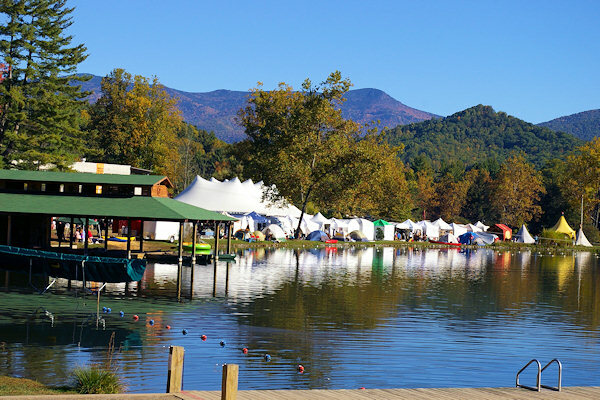 Mitchell and near Black Mountain, the LEAF Festival scenic lake setting is a short drive from Asheville. Experience spontaneous and great music from many corners of the globe. A dizzying array of traditions unite to present a diverse range of cultures: African, Latin, Appalachian, Cajun, Celtic, Blues, Bluegrass and more. 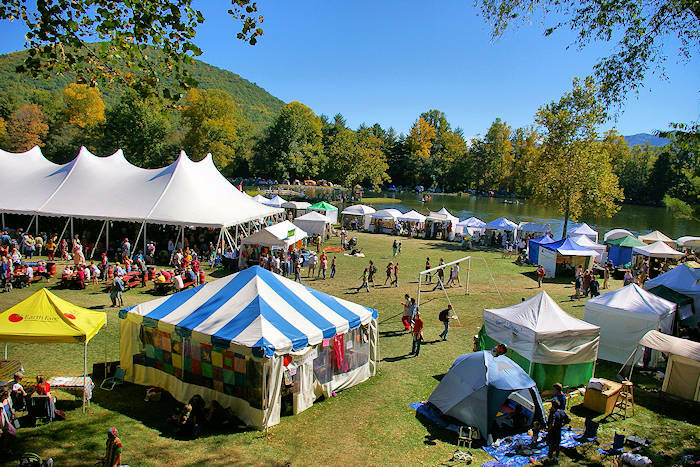 Discover new music and enjoy LEAF traditions during three days with four stages, jam tent, healing arts, poetry and African drum circle. Many of the 12,000 attendees camp for the weekend, creating a community of longtime friends. Day tickets run about $56/person. Weekend tickets including tent camping run about $184/person. Tickets are limited. Save by buying well in advance. 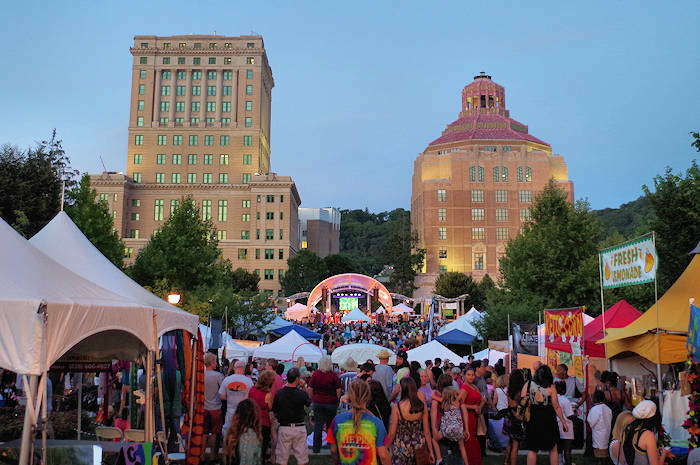 Also enjoy their free festival, LEAF Downtown Asheville, on the first weekend of August. LEAF Festival musicians provide the soundtrack to a memorable experience filled with cultural treasures and fun. Combining a great diversity of names and faces with a myriad of community dances including Salsa, Swing, the Waltz and traditional, contemporary and techno forms of Contra; poetry and puppetry slams; folk art and handcraft exhibitions, installations and interactive demonstrations; camping, watersports and outdoor adventure for all ages. 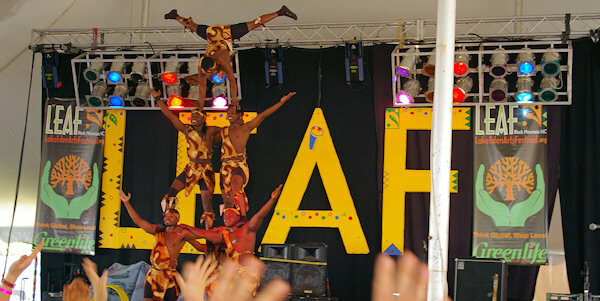 A weekend at LEAF is the equivalent of going on a year-long multi-cultural musical and dance odyssey. 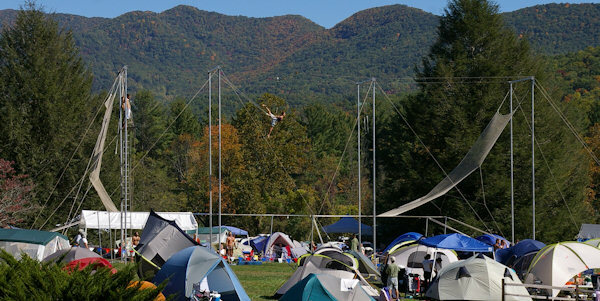 Formerly the historic Black Mountain College and presently a summer camp (Camp Rockmont), it's a beautiful 600-acre site. Rolling hills for camping, mountain lakes for swimming, canoeing, and ziplining, streams to play in, woods to hike and explore, and a setting which is relaxing and inspiring. Many folks come for the weekend with plenty of room to camp. It's only about 12 miles from downtown Asheville. Dance! Contra, Cajun, Swing, Celtic, African, Latin, Clogging, Zydeco, Waltz and more. 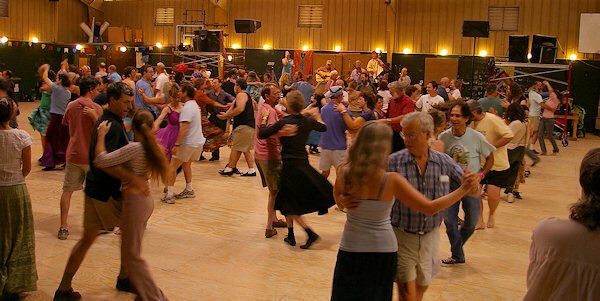 A wooden floor in Brookside Pavilion creates one of the south's largest dance floors. Leave to grove at many dance workshops or mini dance demos that cover everything from belly dance to Irish step dancing. 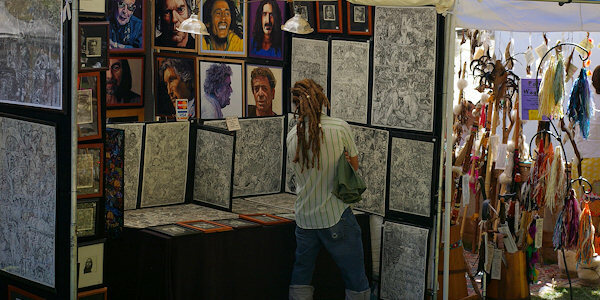 More than 40 artisans, contemporary and folk-styled, demonstrate their craft and sell original artwork, clothing, jewelry, musical instruments and more. The Healing Arts Area weaves an underlying matrix of healing consciousness. Funky costumes and festive attitudes welcome! LEAF Community Arts is a non-profit organization. All donations and festival proceeds support cultural arts education programming locally and globally. Purchase tickets online at the LEAF Web site or by phone at 828-686-8742. Buy tickets well in advance to take advantage of discounts for early bird registration. Adult early bird prices start at $56 for the day or $184 for the weekend. Limited car camping, lodge rooms and cabins are available. From West (from Asheville): 1-40 to Swannanoa Exit 59. Left at end of ramp. Right at light onto US 70. Left at next light,cross small bridge, right at yield onto Old US70. 1.9 miles to light. Left onto Lake Eden Rd. Read and see more at the LEAF Web site.